2 Bedroom Cabin w/Private Yard, Drive and Dock. Pets welcome. Right On Hwy 58. Wonderful location. Our Cabin is only about 10 years old and has been very popular. We are located in the Buffalo Creek-Sorings area of the largest lake in Virginia! It's the best lake for Fishing and Boating!! 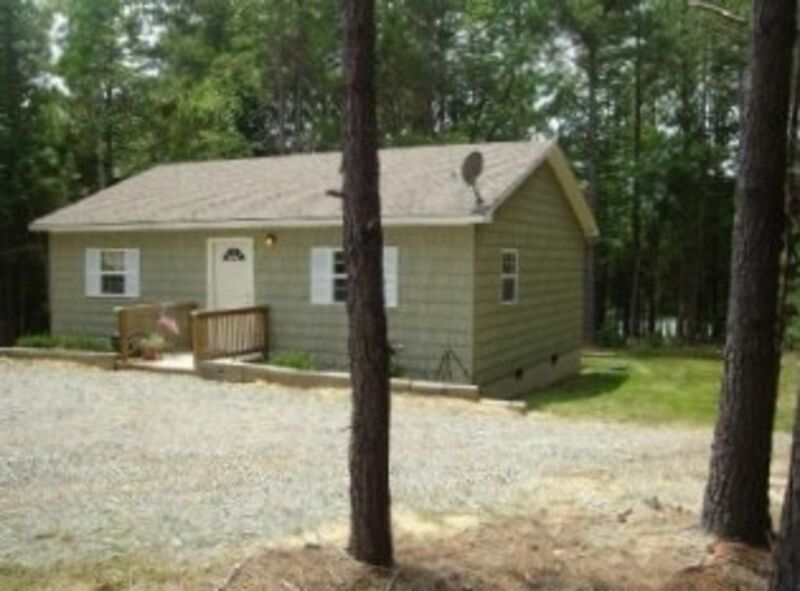 The Cabin is nestled in the trees giving you, your family and pets room to run and play in privacy. Yet, it's only 100 yards from Highway 58, so it's easy to find and is only 5 Miles to Clarksville or 15 Miles to South Boston! The Cabin is fully stocked and we are offering FREE LINENS with a 5 Night Plus Stay! Nicely decorated. Very large Bathroom and full sized Washer/Dryer to keep you clean. Fisherman are welcome. Fishing is popular here all year round. We have room in our driveway to park your trucks and boats. Pull up close to the outdoor faucet or electrical outlet if needed. Buffalo Park and Boat Landing is just down the road for launching your boat. The Park also offers picnic tables, fishing area, playground and a nice swimming area. There are many nice, local Federal Parks plus Occoneechee State Park. The lake is right out the back door with a gentle sloping path through the trees that is easy to walk. Enjoy sitting on the back deck and get back to nature! Boat Rentals are available in town of Clarksville or at Marina. We live on the adjoining farm so we are right here if you need us or have any problems!! The water at our dock is only about 3-4 feet deep so x-large boats are not recommended to dock here. Floating is good but swimming is better at the local parks or out in the open lake if you have a boat. Always go feet first! Never assume you can dive in our lake. And be aware of drop offs! We have a Fish Cleaning Table and placed a Picnic Table in the backyard for your cookouts! Greg is a Sales Manager at a nearby wholesale Greenhouse Operation. I manage a Website for my family business. When we are not working on the farm or driving the kids around, we enjoy the Lake with Friends & Family and going to the beach. ** If you have a rental home & wish to consider a Vacation Trade, please email me the details. We have lived in this area our whole lives and love the Lake! We built this cabin as a source of extra income for our family. We are very proud of the Cabin and its success. The area we built on is very private and gives you the feeling of being 'out in the country'. However, the Highway and the town of Clarksville are nearby. Clarksville has a home-town feeling that welcomes each person. The weather is nice most of the year allowing you to enjoy the outdoors most anytime! Kerr Lake is Wonderful! It's huge and open and great for sports! It's also beautiful!! From the Cabin, you can sit on the back deck and enjoy nature. Take a short walk down to the Lake and our Dock. Most of the time, you can walk the Shoreline of the Lake and enjoy more nature or throw in a fishing line. A lot of Renters have written in our Guestbook about the many fish they caught from our dock. Local events are pretty frequent (Balloons, Lake Fest, Wine Fest, Car Shows & Music 1st Sat, etc), check out the local websites for more. YMCA and many restaurants are nearby for your convenience! We are outside of town, but yes, we are right off of Hwy 58 Eastbound. Feel free to google the address for more images from above. You can see a little of the water. The Corps of Engineers owns 100 yards between house and water. We have kept it natural and the trees block most of the view. It's perfect for the outdoor lover! FREE Sheets with 3 Night or More Stay. Plenty of Linens are available! Please inquire if you want internet. There may be a fee or limited access as it’s not unlimited at this time. Thanks! Bring your own beach towels. Bath towels and wash cloths provided! 1 Standard Sofa and 1 Love Seat. You must provide your own Laundry Soap. There is usually salt, pepper, Pam, Dawn. A table in the kitchen area that seats 5. There is also a Table on deck. We have a package that includes Local Channels too! Check Occoneechee and Clarksville Water Sports for rentals. Check Clarksville Marina and Clarksville Water Sports for rentals. Kinderton Country Club. Very Popular Donald Ross course. This was the perfect property for our recent stay in Virginia while visiting family. We had a bit of trouble finding it at first but only because I didn't fully read the directions at the bottom of the rental agreement lol Jennifer and her husband were very kind & pleasant to work even after I'd officially checked out. I accidentally left a bag of clothes at the property and they were more than gracious in working with me to return my items. I highly recommend these owners & their property. Great cabin getaway with family! We had a great time at this little cabin. The rooms were big enough, nice bathroom and kitchen and living room was just the right size! We had tons of campfires and kayaked. Couldn’t do too much water stuff because of flooding from the hurricane but the dock is very close and would have liked to be able to enjoy that! I will say if you are looking for a secluded quiet place this wouldn’t be it- the highway next to it is very close and busy- you can hear semis on the bridge and it sounds like thunder. Was fine for us but just letting people know. Overall great experience! The house and the dock was perfect. If you are looking for a quiet, cozy, peaceful time away from life....I highly recommend this cabin. Prestwould Plantation is open for tours and is just 10 miles across town. A beautiful and authentic Plantation Home. MacCallum More Museum & Gardens in Chase City. Approx. 25 Miles away. South Boston RACEWAY only 20 Minutes away. Martinsville RACEWAY only 1 1/2 hours away. VIR Racing only 45 minutes away. Fishing Tournaments on Kerr Lake, largest Lake in VA, held almost every week/weekend. The latest news to Clarksville is this year, at Kerr Lake, the State Record Catfish and now the WORLD Record Catfish have been caught! Yes, right here! Rates are subject to change without notice. We reserve the right to block dates at any time.